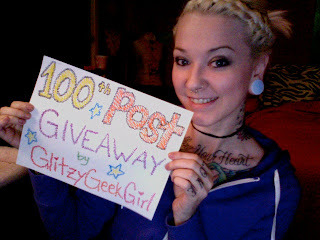 So for this post I want to do a giveaway! The winner will receive a $25 gift card to Starbucks!! Entering is easy! You have from Weds the 17th through Saturday the 20th to earn entries by following the instructions below. The contest will end at 12:00 am (central time) April 21. I will email the winner and mail the gift card as soon as I get your address! Offer available in US only. EDIT:: Contest is now closed!! Thank you all for entering! I am overjoyed with how many participated. Congrats to Tracy R. for winning the gift card! Please check your email. Should I not hear from you within 48 hours then I will pick another winner. I can't wait to do more giveaways in the future. I got a lot of great ideas for new prizes! Thanks all! Congrats! Good luck to all the entrants! Grats on hitting 100 posts. Look forward to more Glitzy Geek Girl adventures! Hope YOU win the SOE trip to Vegas. Suh-weet. I always order the same thing. A giant Green Tea Frap. I would get a very manly iced hazelnut macchiato. Iced caramel macchiato with soy! Thanks for giving away a prize. I enjoy reading your blogs and seeing your cosplays regardless of winning anything, it is a nice bonus. Ps not helping the starbucks addiction go away haha. Anyway, Grande iced caramel macchiato or Grande jave chip frap. (Everyone is going to abbreviate frap. for spelling purposes haha) Grats on 100, keep posting i will keep reading!!!!! I'd get a caramel frappuchino! I like white chocolate raspberry mocha. Either hot, or as a Frappuccino! I would get a hot chocolate and the little whoopie pie treats! Either the hot chocolate or a vanilla bean frappuccino...I love both...so maybe I'd just get both! Your blog's awesome! Grats on 100! Here's to 1000! I would order an Iced Caramel Macchiato! Yummmmm! I love Starbucks! I would get my favorite drink there everyday (a nonfat latte). I do that everyday anyway, but it would be extra special to do it with a gift card I won! Thanks for the giveaway! I sure will, thank you so much! I would order the spinach feta wrap, mmmm! I would get a Iced Caffe Latte! Thank you, I am so excited! Hello! I'm Glitzy! I'm a level 31 Texan with a love for all things gaming and geekery! I've been posting cosplay tutorials for several years and love to help others with my DIY guides. I also regularly stream Guild Wars 2 on Twitch.tv/omGlitzy! I am sponsored by ArenaNet! You can directly support me by using my referral links below!